For other uses, see Allowance (disambiguation). 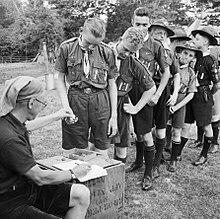 Pay Day for Boy Scouts at a fruit-picking camp near Cambridge in 1943. "Saturday is Pay Day at the fruit-picking camp. Boy Scouts queue up in a pay parade to collect their pocket money from the Scout master. Over 14s get half a crown, whilst under 14s receive a shilling." An allowance is an amount of money given or allotted usually at regular intervals for a specific purpose. In the context of children, parents may provide an allowance (British English: pocket money) to their child for their miscellaneous personal spending. In the construction industry it may be an amount allocated to a specific item of work as part of an overall contract. The person providing the allowance is usually trying to control how or when money is spent by the recipient so that it meets the aims of the person providing the money. For example, an allowance by a parent might be motivated to teach the child money management and may be unconditional or be tied to completion of chores or achievement of specific grades. The person supplying the allowance usually specifies the purpose and may put controls in place to make sure that the money is spent for that purpose only. For example, a company employee may be given an allowance or per diem to provide for meals and travel when working away from home and may then be required to provide receipts as proof. Or they are provided with specific non-money tokens or vouchers that can be used only for a specific purpose such as a meal voucher. if the section 1 costs for the item of work are higher (or lower) than the allowance amount, the base contract amount should be increased (decreased) by the difference in the two amounts and by the change (if any) to the contractor's costs under section 2. The allowance provisions may be handled otherwise in the contract: e.g., the flooring allowance may state that installation costs are part of the allowance. The contractor may be required to produce records of the original takeoff or estimate of the section 2 costs for each allowance item. ^ Weston, Liz (May 20, 2011). "Allowances: 'Welfare' for kids?". CNN. Retrieved October 4, 2012.